Jean DeBoer, age 95, of Lawton passed away on Thursday, January 3, 2019. She was born on March 27, 1923 in Scunthorpe, England and served in the British Army during WWII. She was a loving mom and grandmother and will be dearly missed by all that knew and loved her. Since April of 2018 she was lovingly cared for by her granddaughter Annie and her husband Jeffrey in their home. Cremation has taken place burial will take place in the Oak Grove Cemetery in Lawton. Surviving members of her family include her 5 children: Yvonne (Dan) Dowdin, Sharynne (Dave) Cleasby, Steve (Christine) Arnott, Lynne Thomas, Michelle (Bryan) Sanderson and several grandchildren and great grandchildren. She was preceded in death by her husband Benjamin DeBoer and a daughter Jennifer Englerth. 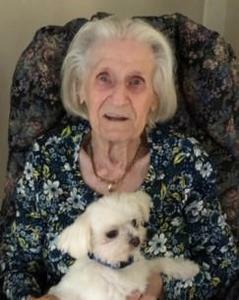 Please visit Jean’s personal memory page at www.BetzlerFuneralHome.com where you can archive a favorite memory or photo, sign her guestbook or make a donation to Paralyzed Veterans of America.